Welcome to the Elite Editing Thesis Write-up Scholarship. Click here to go straight to the scholarship description and application process, or read on about our past winners below. If you’re interested in having our expert editors polish your thesis or dissertation prior to submission, please take a look at our thesis editing page. We are very pleased to announce that Ms Nadia Bellofiore has been awarded the Elite Editing Thesis Write up Scholarship for 2018. 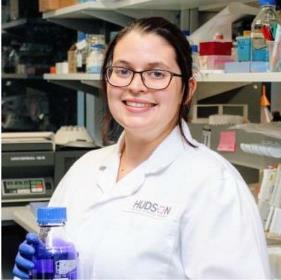 Nadia is undertaking her PhD in women’s reproductive health at the Hudson Institute of Medical Research and Monash University in Clayton, Victoria, under the supervision of Dr Jemma Evans, Associate Professor Peter Temple-Smith and Dr Fiona Cousins. Nadia’s research uses a novel laboratory species, the spiny mouse, and her thesis is entitled: ‘Discovery and characterisation of the first menstruating rodent: the spiny mouse for use as an in vivo model of reproductive biology’. Early in her candidature, Nadia made the unexpected and world first discovery of menstruation in the spiny mouse, the only recorded rodent to exhibit natural menses. Her research is focused on the validation of the spiny mouse as a model to reduce the heavy reliance on primates for research. Through cellular, hormonal and behavioural evidence, her studies demonstrate for the first time that this species shares both physiological and behavioural attributes of menstruation with the human. Nadia’s work aims to implement an increased number of studies using the spiny mouse for menstrual research worldwide, which may provide pivotal clues to unlocking the long-held secrets of impaired uterine function, abnormal bleeding and pregnancy-associated disorders. With this recent breakthrough, the spiny mouse could lead the field of menstruation into a new era, reducing the invasiveness of experimental procedures and drug trials for women, and vastly improving the speed of pharmaceutical developments. Nadia graduated with a Bachelor of Science from the University of Melbourne and a Graduate Diploma in Reproductive Sciences from Monash University. Again we had many very worthy applicants for the scholarship and we thank everyone who applied. We are pleased to announce that Mr Renato Lemgruber is the winner of the 2017 Elite Editing Thesis Write-up Scholarship. Renato is currently completing a PhD entitled ‘From waste to chemicals: On the metabolism of Clostridium autoethanogenum and PHB production from gas fermentation’ at the University of Queensland in Brisbane. His supervisors are Dr Esteban Marcellin, Prof. Lars Nielsen, Dr Kaspar Valgepea and Dr Mark Hodson. His research is focused on an integrated systems biology approach (e.g., transcriptomics, metabolomics and genome-scale metabolic modelling) to understand the energetics and redox metabolism of Clostridium autoethanogenum, and to expand its product spectrum into more valuable products from gas fermentation. Throughout his PhD, Renato has strongly contributed to establishing the world’s first (outside an industrial environment) instrumented fermentation facility for syngas fermentation, and he has already established an impressive publication record. Renato is a graduate in biology from the Federal University of Paraná (UFPR), Curitiba, Brazil. He received his master’s degree in genetics, conservation and evolutionary biology from the National Institute of Amazonian Research (INPA), Manaus, Brazil. There were many very deserving applicants to whom we could easily have awarded this scholarship. Thank you to everyone who applied and good luck with your future studies and careers. The 2016 scholarship was been awarded to Mr Lain Pardo of James Cook University. Lain is completing his PhD entitled “Diversity and habitat use of medium and large-sized mammals across oil palm dominated landscapes in the Llanos region of Colombia” at James Cook University in Cairns, Queensland. He is under the supervision of Prof. Bill Laurance, Dr. William Edwards and Dr. Reuben Clements. Lain’s doctoral research focuses on assessing the impacts of oil palm plantation expansion on larger mammals in Colombia, his native country. The explosive expansion of oil palm in Colombia is a rapidly growing threat to biodiversity there. Lain is using camera-trapping methods to estimate mammal detections and community composition in a range of modified and relatively natural ecosystems in Colombia. His work will clearly have important implications for land-use and conservation policy in Colombia and beyond. After assessing hundreds of applications from Australia and New Zealand, Elite Editing is delighted to announce that the winner of the 2015 Thesis Write-up Scholarship is Guanyu Chen. Guanyu is completing a PhD entitled ‘Development and Optimisation of Novel Nanoparticulate Delivery Systems for Oral Delivery of Gemcitabine to Treat Cancer’ at the School of Pharmacy, Faculty of Medical and Health Sciences, University of Auckland, under the supervision of Dr Jingyuan Wen, Dr Darren Svirskis, Professor Yuan Huang and Professor Weiyue Lu. Elite Editing is very pleased to announce that the winner of the 2014 Thesis Write-up Scholarship is Lauren Rice. Ms Rice is completing a PhD entitled ‘Understanding the Nature of Temper Outbursts in Prader-Willi Syndrome’ at the Brain and Mind Research Institute, University of Sydney, under the supervision of Professor Stewart Einfeld, Professor Patricia Howlin, Associate Professor Jim Lagopoulos and Dr Kate Woodcock. Elite Editing is proud to announce that the winner of the 2013 Thesis Write-up Scholarship is Mr nnaEmeka Chidiebere Meribe. Completing a PhD in Strategic Communications at La Trobe University, under the supervisor of Dr Mary Debrett and Mr John Benson, his thesis is entitled ‘Climate Change Communication and Sustainable Rural Development in Africa: The Nigerian Experience’. The Elite Editing Thesis Write-up Scholarship provides financial assistance for one postgraduate student per year for a period of 12 weeks to free them from other forms of employment and allow them to concentrate solely on the task of writing their thesis. For students who do not hold another scholarship, the Elite Editing Thesis Write-up Scholarship pays a stipend of $1,000 per fortnight for six fortnights ($6,000 in total), tax free. For students who do hold another scholarship, the Elite Editing Thesis Write-up Scholarship pays a stipend of $600 per fortnight for six fortnights ($3,600 in total), tax free. Students must be enrolled full time in a research degree (Masters or PhD) at an Australian or New Zealand university. Part-time students are eligible to apply for the scholarship only in circumstances where the applicant is able to demonstrate heavy carer commitments or a medical condition that precludes them from studying full time. Students may be either internal or external students. Students who hold another scholarship may apply, but in this case would only be awarded a stipend of $600 per fortnight for six fortnights ($3,600 in total), tax free. The student must not engage in any forms of paid employment for the duration of the scholarship (unless Elite Editing is notified of any special circumstances that would prohibit this at the time of application). The student must work on writing their thesis full time (a minimum of 35 hours per week) for the duration of the scholarship (i.e. they must have completed the research stage). Employees of Elite Editing and their family members are not eligible for the scholarship. Elite Editing will assess each application based on the academic merit of the research being undertaken and the financial situation of the student. The successful applicant will be chosen at the sole discretion of Elite Editing. For the answers to Frequently Asked Questions, please visit the Thesis Write-up Scholarship section of our FAQs page. Please ensure you have read the information on this page carefully and read the FAQs section before contacting us to request further information about the scholarship.